If you have read about the construction of Bulleid's Light pacifics, you may know that Brighton works took the credit for most, and Eastleigh for manufacturing six. But Brighton works was under pressure from other jobs, so had assistance from other Southern works for the final batch of 20. Ashford works - more associated with the construction of the bulk of Bulleid's Q1s - cut the frames and constructed the tenders for the final 20 pacifics. 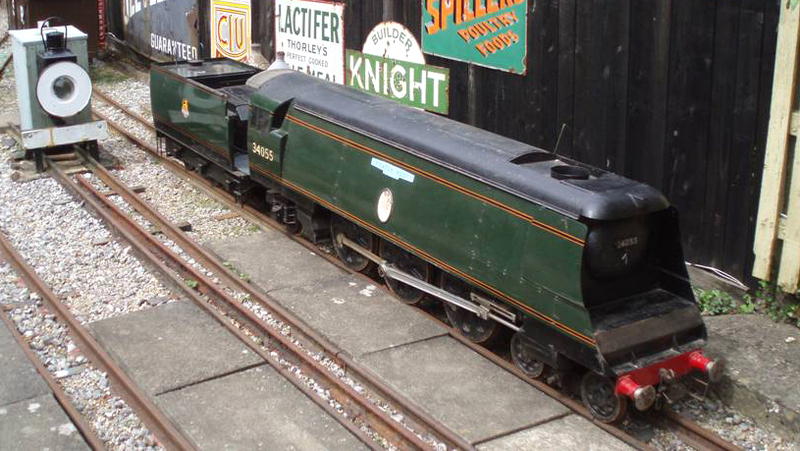 I thought you would enjoy these piccies of the only 'Ashford' completely constructed Bulleid pacific. It all happened back in 1951 which was "Festival of Britain" year, and also the year I commenced my apprenticeship. Ashford still has an annual carnival, but for that year - being the Festival Year - a really special effort was made. Ashford works constructed a 9½" gauge pacific to go on the back of a lorry for the Ashford town carnival procession. I am not certain why a gauge of 9½" was chosen, although it is almost 2" scale; and of course there is the 9½" gauge railway built before the war at Torry Hill near Sittingbourne, by Robin Leigh-Pemberton's father (a former Bank of England Governor). My cousin John Freed who was a Pattern Maker apprentice in the Works did the wood "butchering" bit, and I made a number of the drawings; and other apprentices were also involved. I lost touch with it after that time, except for finding an article in the August 1994 Railway World. In it there was a photo of the loco, now owned by a Norman Hamshere, who had re-gauged her to 7¼" gauge for his railway. A railway colleague Alan Crotty who is a well known photographer, put me in touch with Norman who wanted confirmation of the Ashford connection. Today, she is powered by an electric motor in the tender, and I have been invited down to Ewhurst to have a drive. How splendiferous !!! The 1851 date was the year of the great exhibition at Crystal Palace, so the 1951 Festival of Britain would have been a centenary, hence I think it was a government sponsored event, the reason that allowed the works to join in. The Ashford Carnival as I remember it (well it was over 60 years ago) was a great success. Both my cousin and I are in the picture. I am at the back row on the right, looking rather more like the Mafia do. Must have been a sunny spring, and I go very brown without trying ! The South Eastern Rly, London Chatham & Dover Rly, South Eastern & Chatham Railway, Southern Railway, and British Railways. 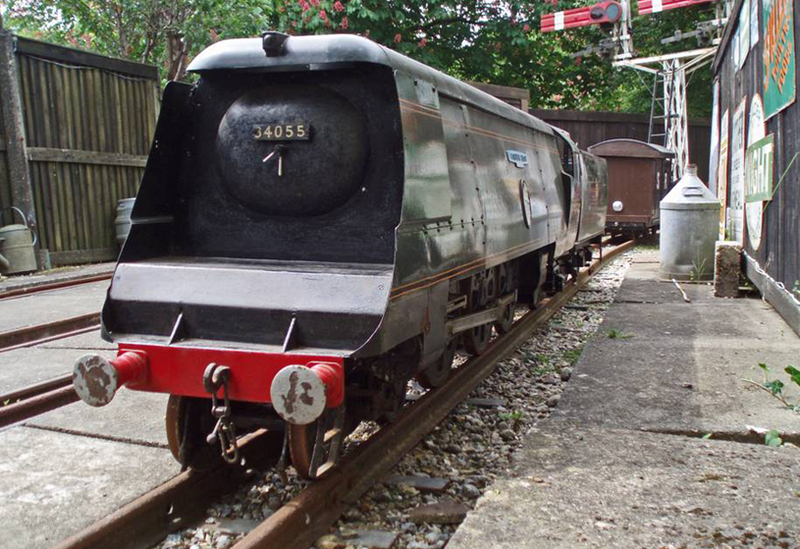 I really like the story of this survivor; and how it (slightly) re-writes the history book for Ashford works; and - (as all good Bulleids should) - this loco exceeded its original brief. But also the joy of a locomotive being re-discovered by someone involved in its construction, over 60 years later - brilliant ! 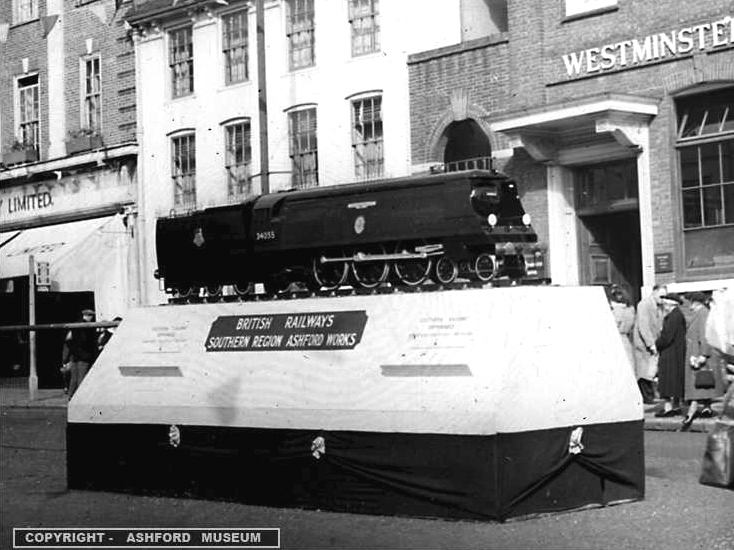 And this final photo, of 34055 'Fighter Pilot' freshly completed, shows it presented for all to admire - as displayed on the High Street in Ashford 1951.